This deeply rich chocolate cake boasts of a warm coffee undertone and is cloaked with smooth buttercream. Speckled between each layer are the three new M&M’s® peanut varieties- M&M’s® Chili Nut, M&M’s® Honey Nut, and our personal favorite, the inspiration behind this decadent dessert, M&M’s® Coffee Nut! Its effects are as versatile and varied as its uses. It lifts spirits. Eases frustration. Enhances moments of joy, and is often companion in moments of sorrow. 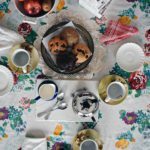 It has become a byword for ‘cheating,’ ‘living,’ ‘enjoyment,’ ‘decadence,’ ‘indulgence,’ and ‘nirvana.’ Cultures have utilized this item for everything from religious rituals, as catalysts for psychic gateways to the gods, and, of course, as the basis for innumerable beloved dishes both savory and sweet. Of course, I am referring to chocolate. 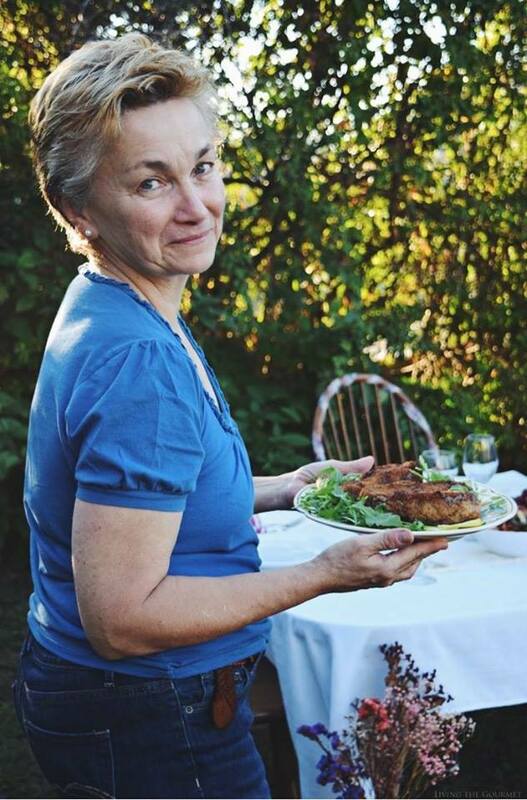 I wrote recently about how we at Living the Gourmet start off the spring season with a pair of birthdays in March and April, and how it provides us with a season long excuse to keep a plethora of our favorite foods on hand. Aside from being great fun, it’s also a wellspring of seasonal creativity. However, all of that celebrating built up to a final gathering this past Sunday with family and friends. While the dinner had to be superb, it was the cake that occupied most of my attention. While I of course wanted what I put together to be new and creative, I still wanted it to be familiar and inviting. Deciding against reinventing the dessert-wheel, I settled on preparing a classic rich chocolate cake with a homemade chocolate frosting. I enhanced the cake with coffee for added richness and flavor complexity. Despite having the menu set, inspiration has a way of upsetting the proverbial applecart. While shopping for supplies at Walmart, I came across three new varieties of M&M’s® – namely M&M’s® Chili Nut, M&M’s ® Honey Nut, and M&M’s® Coffee Nut, all available in 90z bags. This being the time – not – to resist temptation, I picked up all three. After assembling the cake as shown below, I decided to use one of the three varieties as more than a dessert side. 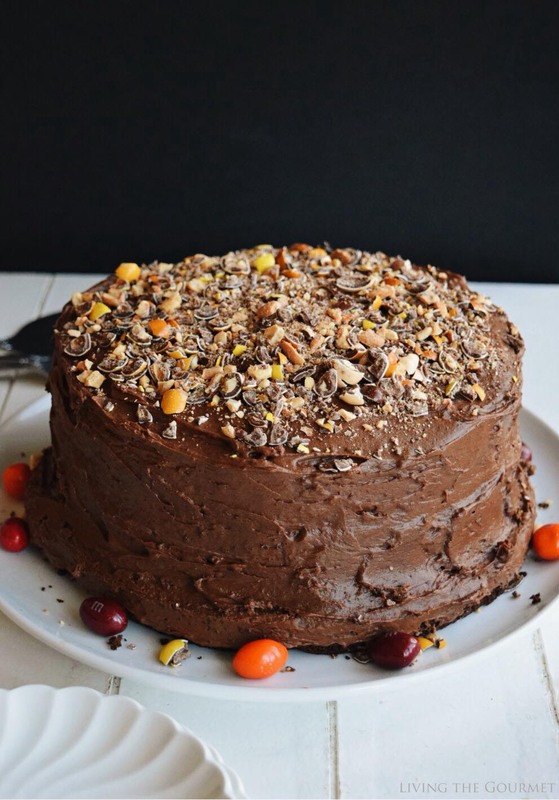 I chopped up the M&M’s® Coffee Nut, and dusted them over the top of the cake for added coffee notes and crunch. Butter and flour the baking pans. Add eggs, butter milk, oil and chocolate extract; beat with an electric mixer for minute or two. Slowly add coffee while mixing. (The batter will be thin). Bake 30 – 35 minutes or until the toothpick test comes out clean. Cool the cake for 10 – 15 minutes before removing from pan. In a large bowl combine the butter, cocoa powder, powdered sugar, chocolate extract and milk. Beat with an electric mixer until smooth and creamy enough for spreading. 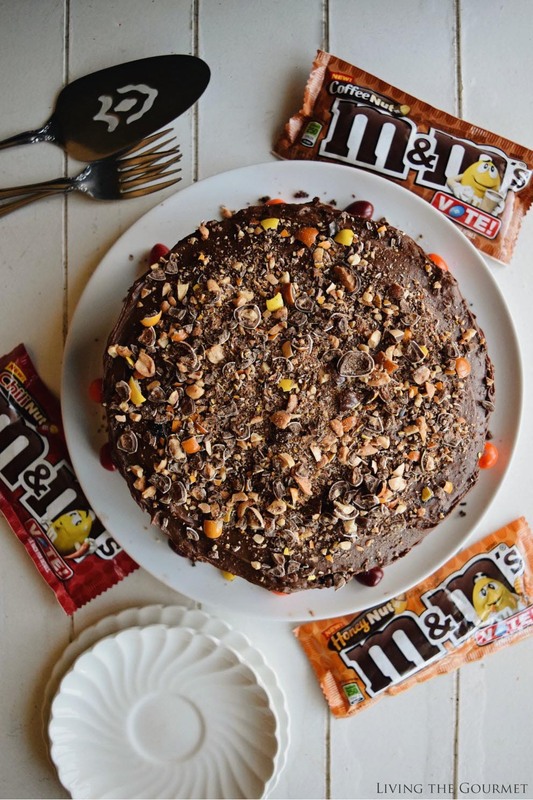 Spread on a completely cooled cake and top the frosting with the crushed M&M's® Coffee Nut. Needless to say, the cake was a success, and was an excellent way to the end of the last several weeks. What are some of your favorite ways to celebrate a birthday? Or what are some of your favorite spring entertaining ideas? We would love to hear from you. 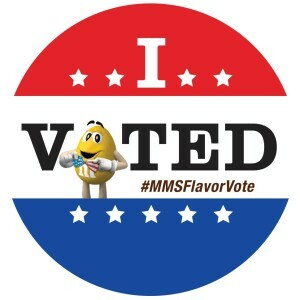 Don’t forget to cast your vote on Facebook for the M&M’s® Flavor Vote! The winner of the three new M&M’s® peanut varieties will be announced in August and will remain on shelves. 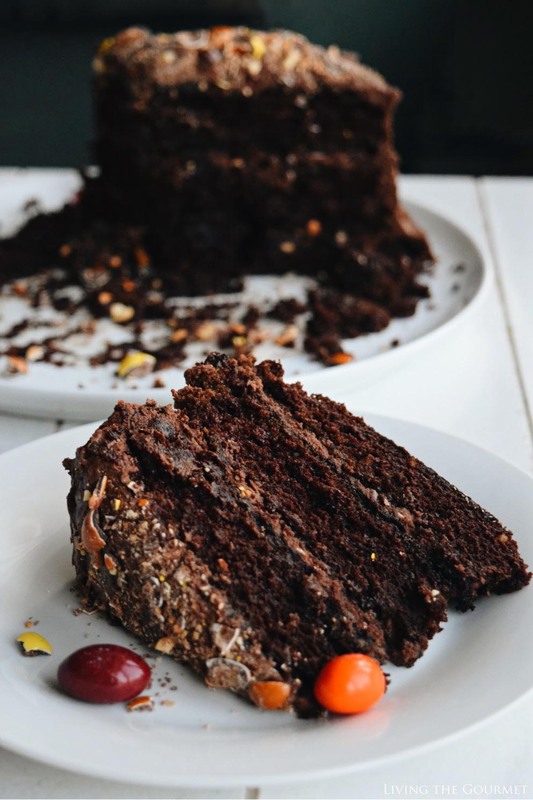 What a beautiful and rich chocolate cake! Oh my goodness! This cake looks absolutely divine! Love the use of M&M's! I love how this cake is so special, and so fun with the M&M's! This will be fun to make for birthday! Hahaha - dear Catherine - I couldn't agree more - Chocolate is all you say it is! And then some -eh? And you have glorified it in this cake - that also has those wonderfully flavored M&Ms in it! Wow - this cake is proof that dessert needs to be eaten first - before the meal! It is a thing of beauty! Now, I've gotta try and get my hands on those new M&M flavors! Love everything about this cake! Those M&M's sound so good! Mamma mia che dolce golosissimo!!!! This cake looks so fun! I love adding coffee to chocolate cake too. Yum! 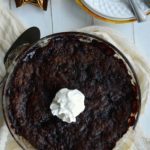 Such a yummy way to push an already yummy chocolate cake over the top! M&M's for the win!!! This chocolate cake look stunning Catherine !! Whenever you pair coffee and chocolate together, I am in love!! This looks incredible! I'm intrigued by the chocolate extract you've used in this recipe. I bet it tastes AMAZING! Such a gorgeous cake and that icing... wow! This is my kind of cake, looks delicious. I'm totally a coffee nut, so this cake is perfect for me! I totally want to try this M&M flavor; I've never seen it before. Yum! 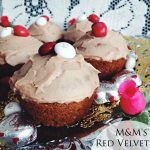 Your cake looks great and I do love coffee and chocolate together, but now have my eye on the chili nut M&Ms too, oh I'll just try them all we love M&Ms. That is such a decadent, pretty cake! My family would love this for a holiday or birthday cake! Yum!! That is one delicious and moist cake! 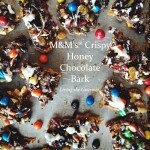 Love all the crunchy bits on top! Oh please give me the big slice on the plate! 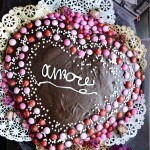 I can't resist to chocolate, and your cake is truly wonderful and irresistible!! It will be tweaked, but I am sooooo making this. Where do I find chocolate extract? The one picture shows 3 pans in the oven, are they 8 or 9 inch pans? Dear Mary Ann, I only had two 8.5 inch pans and one 9 inch. I used the larger cake at the bottom. Thank you so much for stopping by!